On 80 acres of land, once owned by his grandfather who was a cotton farmer, Butch Anthony has found his calling. A self taught carpenter, Butch has been building on the property since he was a kid. In 1988, he had a vision for a log cabin home which he has been crafting- much of it from local, salvaged goods, for a good long while now. It now serves as his home/weekend getaway with his wife, Natalie Chanin. You may be familiar with these two already- Butch is the curator of The Museum of Wonder in Seale, Alabama, which is part taxidermy shop, part artifact museum. And Natalie is the brains and creative spirit behind the fashion and home goods line, Alabama Chanin, based in Florence. The pair, as you would imagine, are quite the crafty duo, but in the most stylish way. The wood burning stove takes its rightful place in the kitchen, while the mantel you see was salvaged from a nearby house that was torn down. And the gorgeous heart pine flooring Butch salvaged from an old mill in Columbus, Georgia. The cabin is built into the side of a hill, which allows this bedroom to be part underground. (Especially nice during a Southern summer) Butch used a rusty spring from an antique bed as a wall hanging and the seats of the two chairs were woven from old ties. 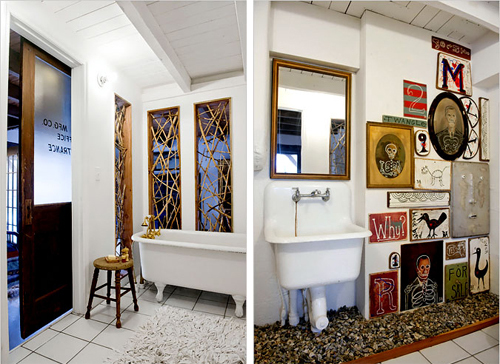 One of the bathrooms in the log cabin is adorned with Butch's colorfully twisted art. After he found some old family portraits (not his own), he embellished them with scary looking skeletons and such. Butch and Natalie's daughter, Maggie enjoys some bedtime jumping, while the 'windows,' made from beaver-chewed sticks, offers a surprisingly stylish backdrop. 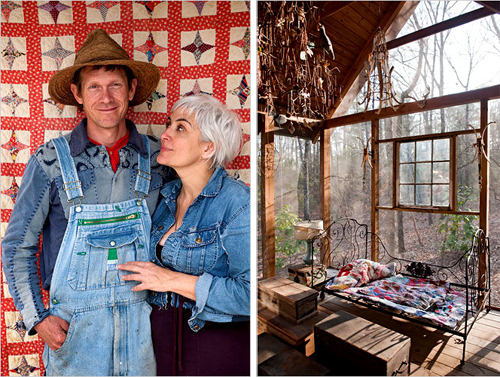 I've been a fan of Butch and Natalie's work for years so it's nice to see how they relax - at the cabin filled with salvaged goods, skeletons and beaver sticks. Not sure anyone else could pull it off as beautifully as they can...see more pics and info on their Alabama abode, here.